A vehicles brake horsepower (bhp) is a way of measuring the power a vehicle has before losses of power are caused by other components in the vehicle, such as the power steering pump, gearbox and many other vehicle components. If you are looking for a quick and easy way to find out a vehicles BHP based on its registration plate, then you are in the right place. Simply enter the vehicle registration below to generate your free report which includes details such as: Vehicle BHP, Tax, Mot and more. 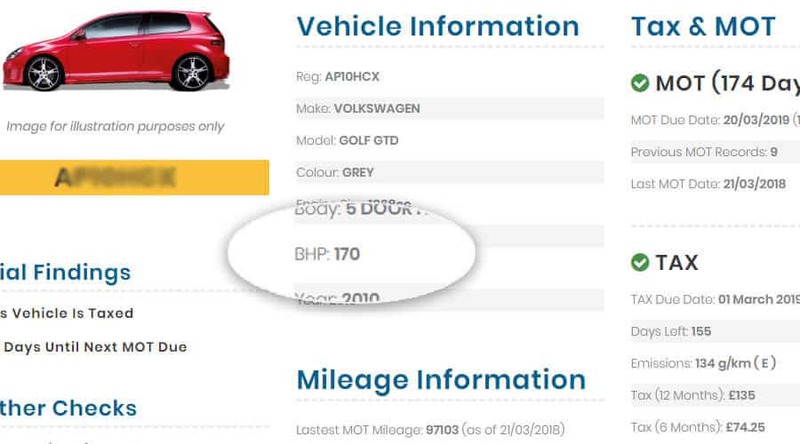 Once you have entered your vehicle registration, you will be taken to the free report page which displays vehicle data about the vehicle you have entered (including the vehicles BHP). Shown below is an example report which shows vehicle information as well as Tax & MOT history check. I was impressed with the details I saw on my vehicle checks in relations to Bhp, Road Tax and Mot history with detail comment. I did all this for free by entering my vehicle registration number. Ofcourse there are other services available on this site. Just browse through. Bravo just keep this good work.